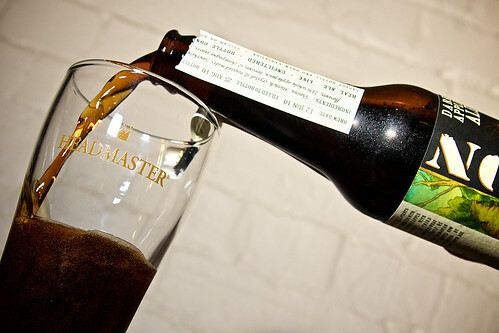 Dark Apple Ale a photo by BaboMike on Flickr. Well, it was a test. Not the best photo I’ve ever taken. Yes it’s sharp and well exposed, but I could do more with the composition. It was just a test after all. Pouring a beer you really only get one shot at it. More photo’s require more beers. And more beers = worse photo’s. Another day perhaps. Have you ever had that day at work where you have a long list of big important things to do, but never get more than about 5 minutes alone to even start on anything? That was today. Little thing after little thing kept on coming up. Most of them not quite in my job description, but certainly within my realms of interest. Lots and lots of learning, some frustration, some confusion, some head banging on the desk and a few too many delicious aeropress coffee’s. And more of the same tomorrow I suspect. Oh well. I’m enjoying it, time is flying and I get paid. Can’t complain.